This posting completes the descriptive formula for the Matter-Being Paradigm and, embedded in it, the Holon Theory of Everything based on mapping the Mind—Soul—Spirit Holon onto every branch of knowledge from the Ancient to the Modern. Here the assumption is that all knowledge whether ancient or modern is assumed valid until otherwise disproved. 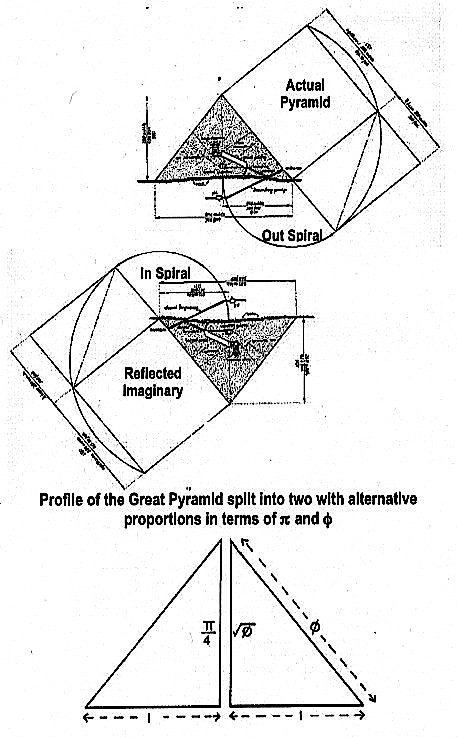 Hidden in the dimensions of the Pyramid as shown in Diagrams 4 and 5. In addition, this posting completes the Ancient [right-brain] and Modern [left-brain] integration formulated in posting Co-Creation Holons; Past-Present, and shown again in the following diagram, namely completing the box refers to as “Atlantian-Egyptian Right-Brain Technology”. 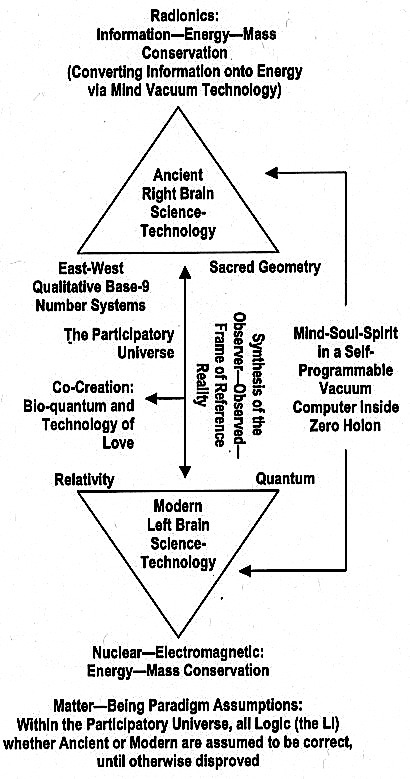 The following Diagram 3 completes Diagram 2 for an East-West / Ancient-Modern integration in Right-Left Brain Science and Technology. Ancient science was based like that of today on number, but whereas number is now used in the quantitative sense for secular purposes, the ancients regarded numbers as symbols of the universe, finding parallels between the inherent structure of number and all types of form and motion. Theirs was a very different view of the world from that which now obtains. They inhabited a living universe, a creature of divine fabrication, designed in accordance with reason and thus to some extend comprehensible by the human mind. 3024 ft = 1750 longer Egyptian cubits of 1.728 ft.
… So the only way of reckoning the height of the finished Pyramid is by measuring the angle of its lope. … about 510 51’. …This angle … confirming the claims that the Pyramid monumentalizes the formula of pi, making the height (if 3024 ft. is the perimeter of the base and 22/7 = pi) equal to 280 shorter Egyptian cubits of 481.0909 ft. The limitations of measurement, however, allow for another interpretation of the relationship between the base and the height. If the angle of slope were very slight less than 51O 51’ 38” to be exact, it would represent the phi angle rather than pi. … By this means the functions of both pi and phi could be demonstrated together in [the two diagrams shown below]. 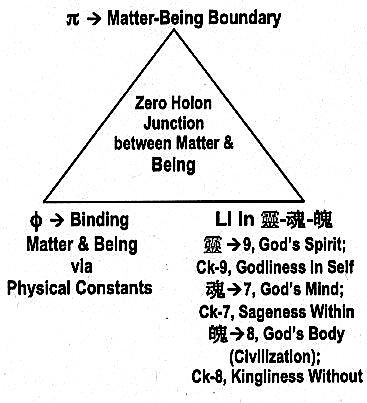 The Zero Holon is shown in Diagram 1. 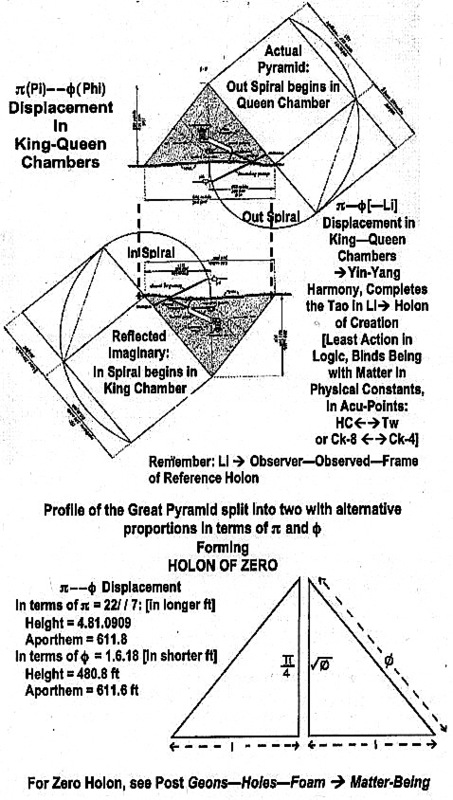 Thus, the power of the Pyramid depends on the Li within the Zero Holon; namely, the Observer—Observed—Frame of Reference Holon.